From the headline it would seem that this would be the awesomest thing ever. A robot that rides a quad. The reality is a lot more meh. Sure the robot looks like a stormtrooper from Star Wars. And everyone knows quads always lead to a good time. But after a watching the robot-biker slowly make its way around the track in this video from RT, even the fire in the background can’t make this video as cool as it should be. 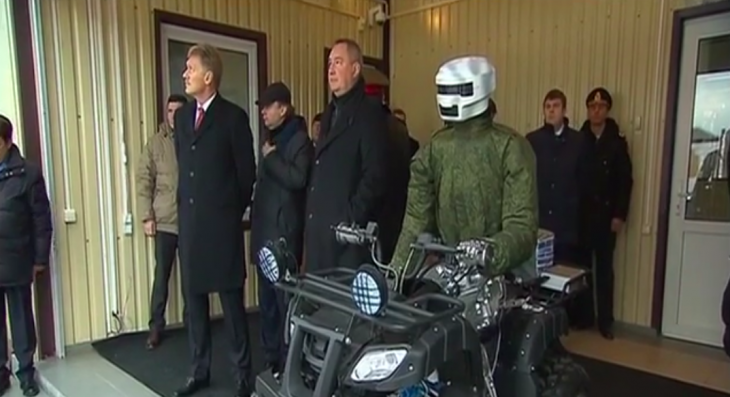 Even Putin has trouble being excited about his country’s robot technology. You can see the moment he wishes he had stayed at home and watched Netflix instead. And don’t get me started on the title of this video. Everyone knows a cyborg is a robot with living parts. Maybe next time they’ll get the bike above 10 mph and add lasers.